Maria Loredo, Chief Operations Officer at Virginia Garcia Memorial Health Center (VGMHC), has seen the center grow from its humble beginnings in a three-car garage to a growing network of health centers dedicated to the medically needy in Washington and Yamhill counties. From her first assignment as a receptionist in 1978, Loredo has risen through the ranks to create and manage programs and clinics for VGMHC. The namesake of the center, Virginia Garcia, was the daughter of migrant farmworkers from Mission, Texas. Accompanying her farmworker parents to Oregon to pick strawberries, Virginia Garcia spent her last days in a migrant labor camp near the city of North Plains. There she developed blood poisoning from a simple foot wound. She received medical treatment, but because culture- and language-appropriate medical services were not available, she ultimately died. She was six years old. Stunned by this tragedy, community leaders of the Hispanic and medical communities joined forces in an unprecedented effort to insure that such a tragedy would never be repeated. Centro Cultural, a Hispanic social service organization in the area, teamed up with St. Vincent Medical Center and opened the Virginia Garcia Memorial Health Center in a converted three-car garage on July 3, 1975. Latest figures show that 81 percent of VGMHC patients are Hispanic, and about 73 percent of patients have no health insurance. The center continues to develop and expand its programs to meet existing and emergent needs. Now, it is a stable, fully established Migrant and Community Health Center with a staff of 65 medical and social service professionals. Each year, the center provides more than 25,000 medical visits to the medically needy through its Washington and Yamhill county locations. During her 28-year tenure at Virginia Garcia, Loredo has been instrumental in program design for the center’s various locations. Here, she shares her inspiring story with Oregon Minority Business. My family lived in the Rio Grande Valley in Texas, along the border between Mexico and the United States. We worked as migrant workers in the cotton and tomato fields, but mostly followed the cotton. We came out to Plainview and San Antonio. I was only 5 or 6 years old, picking cotton with my family. We didn’t even know what a strawberry was. So we came to Oregon and ended up in Albany and Jefferson. It took us about seven days to get to Portland in one of those flatbed trucks. There were seven of us in the family. There was another family of eight, and another family of 6, and we all lived in the migrant camp. The contractor that brought us over promised that we would all get paid $1 per hour, then we’d get a certain amount for each box of strawberries picked. When we got here, they didn’t pay us what was promised. We worked for 50 cents an hour and got 20 cents per box of strawberries, instead of the 25 cents promised. One day, people from the state came to ask workers about the situation at the camp. My dad told the wage-per-hour people what was happening. 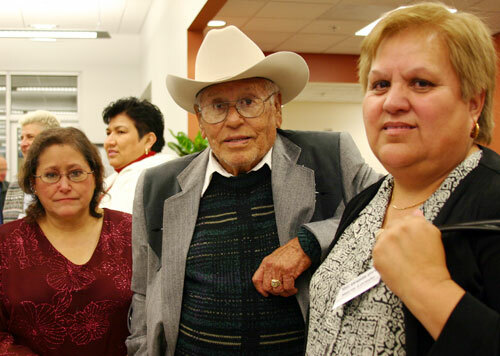 Maria Loredo, right, with Alberto Garcia, father of Virginia Garcia, the namesake of the health care center committed to meeting the needs of underserved populations in Washington and Yamhill counties. Alberto and daughter Alma (left) visited Oregon in October for the opening of the new Hillsboro clinic. October 2006 was the first time Alberto has been back to Oregon since Virginia's death in 1975. The Garcias live in Mission, Texas. The next day, the contractor came and kicked us out of the camp, because my father complained to the state authorities. We had no place to go and we had no car to move out of there. So my Dad bought an old car and got someone else to drive it because he didn’t know how to drive. We moved to another camp. We came to pick strawberries for six years, then decided to stay in Oregon. I went to school through the sixth grade, then stopped, because of my father’s belief that women don’t need a lot of education. As long as you can speak and write English, you’d be fine. I continued to work at the migrant camps, where they offered GED review during the winter. I studied for two months, took the test and got my GED. Another four or five years went by, and I started attending Chemeketa Community College, planning to study nursing. I also started working at a dermatology clinic in Salem as a medical assistant. The nursing program had a lottery system, and I waited for three years but never got in to the nursing program. I soon applied to attend the University of Washington and University of Oregon, to study biology. Then, my soon-to-be-husband – who was also a migrant – asked me to get married. I accepted his proposal. Two weeks later, I received my acceptance letter to UW. I chose marriage over college – a lot of it had to do with culture. I believed that I had to be close to family, because a woman on her own was not safe. When I moved to Washington County to get married, I found that there were a lot of migrant camps, with a lot of families living there. I started working as a migrant home school consultant for the Forest Grove school district. I worked with families of migrant children to find out what they need. I’d take the children to get medical care, or take them shopping to buy shoes and school supplies so they can be successful in school. It was a good start for me, because I got to know the community. Every single person I know now were people that I met during that year (1977). Some of them have become my compadres and comadres after a while. I was able to connect back to the migrant community through my work. At that time, the first Virginia Garcia clinic had already been established. I was bringing the children to the clinic for immunizations and well-child checkups. One day, the manager asked me if I wanted to work for the clinic during the summer. Because my job was with the school district, I was off during the summer, so I accepted the offer to work as a receptionist for the Virginia Garcia clinic. Working at the clinic was great because of my interest in the medical field. I really enjoyed working with the families and children. I soon began identifying areas in the clinic that I can help improve. There wasn’t a system for medical records, so I helped redesign that system to eliminate duplicates. We came in on a Saturday and set up the new system, and it worked. That was my first system design task. Before long, I started managing the front office until we started becoming bigger, adding new locations and serving more people. I helped with system and program development and staff supervision. In addition to program management, my other passion is working with the migrant camps, to get people to come to the clinic. I was heavily involved in developing the migrant camp outreach program. I started moving through the organization, working in various management positions. While working full-time, I attended college at Portland State University and received my bachelor’s degree in Social Science in 2002. During the 1990s, the center started growing rapidly. We added the vision, dental and OB clinics. In 2002, we opened the clinic in Hillsboro. Also during that year, the position of Chief Operations Officer became available, and (executive director) Gil Munoz offered me the position. As health care workers, there are still a lot of things for us to do. Health care isn’t available to everyone in Oregon who needs it: from children to pregnant women. There are a lot of people who are uninsured. There are a lot of people who don’t have access to basic health care. There isn’t enough health education available. As an administrator, one of my most important goals is enhancing the cultural aspect of providing service. It’s important that we are not only providing culturally appropriate service, but that we also have the right people. We make an effort to hire bilingual and bicultural people who are sensitive to the cultures we serve. Beyond the Latino culture, we also serve a lot of immigrants from Africa and other regions. What makes our clinics rich is our diversity. I enjoy the complexity of health care. I like being challenged in my work: making sure that clinics are running smoothly, that we’re meeting the needs of our patients, our doctors, and our clinic staff. When my phone’s ringing all the time, I’m excited. Everyday, I check in with my clinic managers to see if there’s anything I can help with. That’s what keeps me active. If I didn’t have that, I wouldn’t know what I’d be doing. When I’m to the point where I think I’m done with a task, I feel that I need to find out what else is there to do. "Every single person I know now were people that I met during that year (1977). Some of them have become my compadres and comadres after a while. I was able to connect back to the migrant community through my work." "As health care workers, there are still a lot of things for us to do. Health care isn’t available to everyone in Oregon who needs it: from children to pregnant women. There are a lot of people who are uninsured. There are a lot of people who don’t have access to basic health care. There isn’t enough health education available."